Former Justice Major B. Harding was the 74th Justice to serve on the Supreme Court. He served from 1991-2002. He was appointed by Governor Lawton Chiles on January 22, 1991. Justice Harding is a native of Charlotte, North Carolina. He began his tenure on the bench in Florida with his 1968 appointment as a Duval County juvenile court judge. In December 1970 he was appointed to the circuit bench in the Fourth Judicial Circuit. As a circuit judge, he was elected chief judge in 1974 and again in 1975. At the time of his appointment to the Supreme Court, he was the dean of the Florida Judicial College and Chair-elect of the Florida Conference of Circuit Judges. In 1996, Justice Harding was appointed Chair of the Florida Court Education Council. Shortly after becoming Chief Justice in July 1998, he was retained on the Court by the voters of Florida. He served as Chief Justice through June 2000. 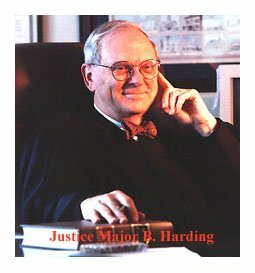 Justice Harding received his bachelor of science and bachelor of laws degrees from Wake Forest University, Winston-Salem, North Carolina, in 1957 and 1959, respectively, and he attended the United States Army Infantry School and the United States Army Judge Advocate General School. Justice Harding received a degree of Master of Laws in Judicial Process from the University of Virginia School of Law in 1995. Justice Harding received an honorary doctor of laws degrees from Stetson University in 1991 and from Florida Coastal School of Law in 1999. While at Wake Forest, he was a member of Phi Delta Phi Legal Fraternity, Sigma Chi Fraternity, and Scabbard & Blade Honorary Military Fraternity. He was admitted to the North Carolina Bar in 1959, to The Florida Bar in 1960, and is a member of the American Bar. From 1960-62 he served as assistant staff judge advocate at Fort Gordon, Georgia, where he received trial experience in general courts martial, legal assistance, and government contracts. From 1962-1963 he was the assistant county solicitor prosecuting in Duval County's Criminal Court of Record, and in1964 he entered private practice. Justice Harding served on the Supreme Court's Matrimonial Law Commission, the Gender Bias Study Commission, the Bench Bar Commission, the Florida Court Education Council, the Judicial Council, and was a founding member of the Chester Bedell Inn of Court in Jacksonville. In 1995-96 he was president of the Rotary Club of Tallahassee. He is Past-President of the Tallahassee American Inn of Court. Justice Harding chaired the Florida Court Education Council and the Supreme Court Committee on Law Related Education and is a member of the American Bar Association, Bar Admission Committee. He also served as an ex-officio Board Member of the American Inns of Court and as Master Emeritus of the Chester Bedell and Tallahassee American Inns of Court. Justice Harding served as Dean of the New Judge's College from 1984-1992 and as a member of the faculty from 1984 to the present. In 1986, he received the American Academy of Matrimonial Lawyers Award for outstanding contribution to the field of matrimonial law; and in 1980, the Young Lawyers Section of the Jacksonville Bar nominated him for the Outstanding Circuit Judge award. While a circuit judge, he was consistently rated at the top of the annual judicial polls of the Jacksonville Bar Association. In 1997 Justice Harding was the recipient of the Significant Sig Award by Sigma Chi Fraternity. In September 1998 he was awarded the Justice Harry Lee Anstead Professionalism Award by the Dade County Trial Lawyers Association. Justice Harding received the American Bar Association Commission on Lawyer Assistance Programs Judicial Recognition Award. He received the Jurist of the Year award from the Jacksonville Chapter of the American Board of Trial Advocates for the year 2000. Most recently, he was awarded the 2001 Distinguished Service Award by the National Center for State Courts; the William A. Dugger Professional Integrity Award by the Capital Rotary Club; and the 2001 FLABOTA (American Board of Trial Advocates in Florida) Jurist of the Year Award. Justice Harding was active in civic affairs in Jacksonville. He has served as a board member for Daniel Memorial in Jacksonville (a psychiatric treatment center for disturbed youth) and was president of the Rotary Club of Riverside, Jacksonville. Justice Harding also served as chair of the United States Constitution Bicentennial Commission of Jacksonville in 1987. The Jacksonville Area Legal Aid Association is located in a building named The Major B. Harding Center for Justice in downtown Jacksonville. 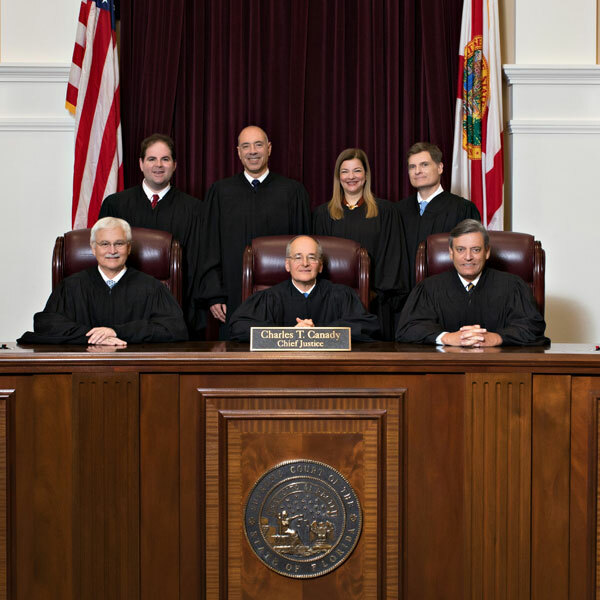 He received the William Hoeveler Judicial Award at The Florida Bar Annual Meeting in 2002 and the Tradition of Excellence Award from the General Practice, Solo, and Small Firm Section of The Florida Bar in 2006. He has been a member of the Board of Visitors for Wake Forest University School of Law in Winston-Salem, N.C. and the Reformed Theological Seminary in Orlando, Florida, and a trustee of Trinity School for Ministry in Ambridge, P.A. He has also served as President and Chair of the Economic Club of Florida. Justice Harding retired from the Florida Supreme Court in 2002 and began work with the firm of Ausley McMullen in Tallahassee. He is a member of St. Peter’s Anglican Church where he has served as Senior Warden and currently serves on the Executive Committee of the Anglican Church of North America. He married Jane Lewis in 1958, has three children, eight grandchildren, and one great grandchild.